Spoofed SNMP Messages: Mercy Killings of Vulnerable Networks or Troll? All the packet captures we received so far show the same behavior. The scans are sequential, so it is fair to assume that this is an internet wide scan. We have yet to find a vulnerable system, and I don't think that vulnerable configurations are very common but please let me know if you know of widely used systems that allow for these SNMP commands. This could also just be a troll checking "what is happening if I send this". - set the default TTL to 1, which would make it impossible for the gateway to connect to other systems that are not on the same link-layer network. - turn off IP forwarding. The e-mail does not use the typical "Delta" formating/branding. The attachment is a straight executable, just zipped. 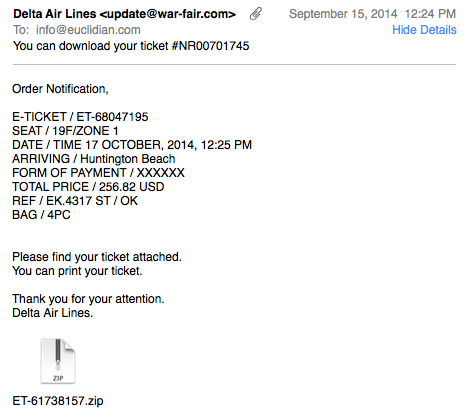 Delta doesn't send tickets as attachments like this. So they could do a lot better. The sad part is, that they apparently have no need to do better. The "From" name, which is what most people are looking at, reads "Delta Air Lines". Some major/popular AV tools still don't detect it well at all, and well, users like to click on stuff I guess. The initial piece of malware appears to be a generic downloader. In my system, it installed what looked like a fake Adobe update. Still running it to see what is exactly going on, but not expecting too much.